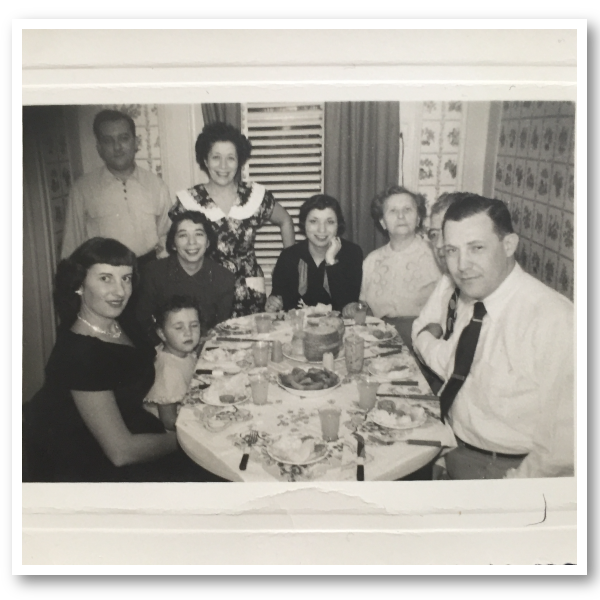 In this episode of The Heritage Cookbook Project Podcast, we talk about honoring cultures within a blended family, challah and shabbat, and how a pancake has emotional and nostalgic value. Leigh Olson: This is The Heritage Cookbook Project podcast where we connect with cooks across the country to talk about food memories and family recipes and learn just a little bit more about one another. And I’m your host Leigh Olson. Leigh Olson: In my chat with blogger and content creator Beth Lee. We talk about her grandma and aunt’s tiny Brooklyn kitchens, the blending of cultures and how one ingredient can result in two very different iconic cultural dishes. Beth Lee: I was born and raised in Pittsfield, Massachusetts, which is a small town on the western side of Massachusetts in what they call the heart of the Berkshires. And when I was 11 years old, my dad was transferred to a field office for General Electric at Lockheed and we moved to California. Leigh Olson: Do you still have family on the East Coast? Beth Lee: I do. Uh, my mom was one of six children in her family. She was the one who, who flew the coop and left the east coast. My cousins are anywhere from like New York, New Jersey, and then down to the Florida area. I was raised in the Jewish faith. Both my parents are Jewish, very traditional. Um not super religious, but we used to do things like family circles where we all gathered together and the extended family to just be together in New York and in very traditional like Ashkenazi-type of food. Both of my parents are from eastern Europe, their family is from eastern Europe, the typical like noodle kugel and potato kugel and um, you know, the very Ashkenazic eastern European foods is what I was raised with. And then the very New York things, the Deli pastrami sandwiches, sour pickles. And probably the biggest memory of all of it is my grandmother and her baking. And my grandmother lived in a tiny apartment and my aunt lived right across the way. And um, we’d all squeeze in those two apartments. We’d usually come on a Friday night and my grandmother would have challah waiting for us on the table. Always. Leigh Olson: Explain challah, how is that different from any other bread? Beth Lee: It’s an egg bread. Generally it’s braided. And with, you know, could be three strands, four strands, five strand, six strands, and on certain times of the year, that braid is then taken and turned into a circle because the circle is symbolic during, for example, the New Year of the Jewish new year, which is called Rosh Hashanah. I think what’s most unique about it is it’s symbolic every week when we celebrate Shabbat. And Shabbat is from sundown on Friday night to sundown on Saturday night. It’s the time when the week ends. You know, the idea is to take a break and be with family and, and in the modern times, you know, put your electronics away. Um, you light candles at sundown and you always have challah. So in a lot of families. Um, certainly, um, like where my, my mom and dad are particularly my mom was raised every Friday that they celebrated Shabbat and there was always challah on the table and a hot meal on Friday night. Leigh Olson: After the break, find out how a California born Korean American with ties to Hawaii and a transplanted East Coast Jewish woman on her family traditions with two very different dishes that start with the humble egg. 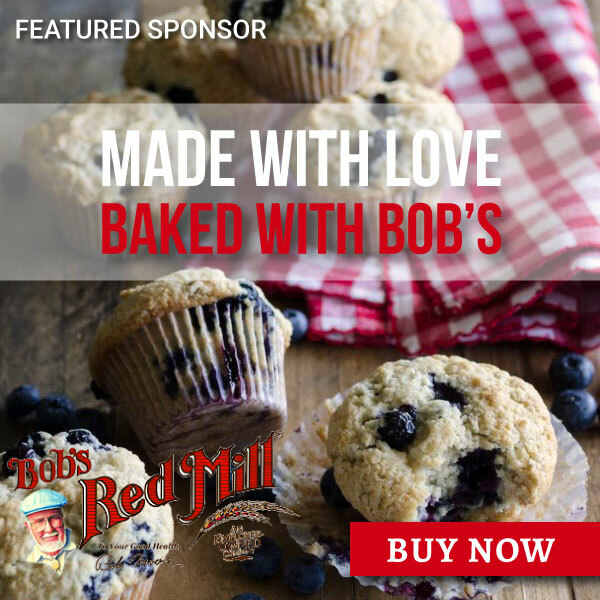 Sponsor Spotlight: This episode of The Heritage Cookbook Project podcast is supported by Bob’s red mill. When you’re making those treasured family recipes, don’t leave the quality of your ingredients to chance visit Bob’s red mill.com to find out more about this employee owned company, their products and how you can fill your pantry with them. With their products, not their employees. 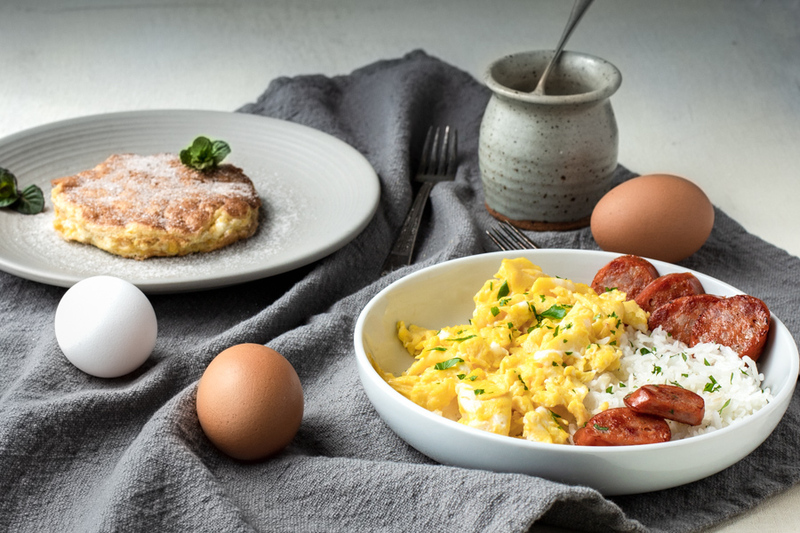 Leigh Olson: And now back to Beth and two recipes for eggs that are as different as her and her husband’s cultures, but play a very important role in the traditions that their family has built together. Leigh Olson: Where did you meet Doug? Beth Lee: I got my degree at UC Berkeley and I was lucky enough to get a job every summer working at Intel. And the summer before my junior year, I was working in the department where he was working and that’s how I met him. Leigh Olson: You’re from very different cultures. When you decided to get married, did you have any discussions about the differences and how you might be able to mitigate any issues that would come from that? Beth Lee: Absolutely. We did. It was really important to me that we raise our kids in the Jewish faith. I was very open to learning about his upbringing and his traditions and even continuing his traditions. But it was very important to me that our kids be raised in the Jewish faith. Um, but we still honor my husband’s traditions. Doug’s of Korean descent. His parents were both born in Hawaii and his grandparents came from Korea. But I think if anything, we very, very much identify with his Hawaiian heritage. One of the things that, um, he ate growing up was something really simple, but it’s, and it’s really very Hawaiian. It’s soy sauce that just adding soy sauce to eggs and scrambling them. But it’s always served with steamed white rice and then Portuguese sausage. In fact, you can even go into a Mcdonald’s in Hawaii and you can get Portuguese sausage, rice and eggs. We prefer the spicy version and that kind of grilled charred sausage against the steamy white rice and uh, um, kind of creamy, a little bit salty Umami-ish eggs is just really, um, what we all would live for. Then every time we go to Hawaii now, big, big bowl of the tropical fruit, steamed rice, Portuguese sausage and eggs, that’s really every morning that were there. That’s what we, what we would eat. Leigh Olson: Now you also have an egg recipe that was kind of central to you and you were growing up. Beth Lee: Yes. Yes, exactly. So this is what’s so amazing about food and different ingredients is how you can take the same ingredient, an egg, and turn it into something so very different and have it attached to such different memories in your own life and other people’s lives. Uh, so on my side of the family, um, growing up, aside from some of the things I mentioned earlier, like my grandmother’s challah for example, the other thing my grandmother would make and my mother also did learn to make, um, was something called a bubula, which is also an affectionate term for grandma, um, so you can think of this as like a very comforting kind of dish. But it’s basically a matzo meal pancake. You separate out the eggs and um, you whip the egg whites to make them fluffy and then you put them back together with the yellows and some matzo meal. And matzo meal is basically matzo, which is a flat cracker that’s been all ground up into really small pieces to be like a flour. And then you cook it up in a pan with some oil. That’s how my grandmother always did it with a little bit of like canola oil, vegetable oil. When she took it out of the pan, she put some cinnamon sugar on it. Leigh Olson: Was there a special occasion that she made the bubula for? Beth Lee: So a bubula is probably more traditionally eaten on Passover. But for me it’s not an association just with Passover. It was just one of those things that it’s a comfort food for me. And when you put that cinnamon sugar on top, it’s like, you know, reliving my childhood. The bubula was kind of convinced me that moving into the food business and to food content creation and blogging was where I was kind of meant to be because, um, I saw how you can connect with not only people you don’t know around the world, but even your own family. I sent out an email saying that I had written about grandma and somehow it got to my cousin in Florida. And this is my cousin who lived across the hall from my grandmother. And he grew up eating bubulas. And then he wrote me the most wonderful email about, um, how it, how happy he was that he now had that recipe. Which, you know, to the point of your project that you’re doing, you know, how important these old recipes are and how meaningful they can be to people. Leigh Olson: It is so interesting when you talk about family recipes and the memories that it brings up and the discussion that it invokes is really, it’s amazing to me. Beth Lee: The idea that I brought back, you know, something from his childhood that was meaningful to him because I shared a bubula recipe that that was really like, that was a special moment for me. Super Special. If you’d like, I’ll, I’ll share with you what he wrote to me. Leigh Olson: Could you read it? Beth Lee: I could. He says, this is my cousin from Florida. He says, I wanted to thank you for making available grandma’s pancake recipe. I have looked for that recipe in every Jewish cookbook around and never found it. Of course, I never thought to do the obvious. Ask the family Civy that’s his wife made the pancakes tonight and they were great topped with sugar and, this is another way of eating them or a little Manischewitz concord grape wine as we did in our house in Brooklyn. Of course, the greater significance beyond the tastiness of the pancakes were their emotional and nostalgic value for the duration of the meal tonight. Always tears me up. I was 10 years old again and back at 414 Avenue N with my mommy and grandma in the kitchen. It was a truly wonderful and sentimental moment for me. Thank you for giving me the venue to return, at least in my mind’s eye to those wonderful years in a world that now seems all too distant. Sorry. That tears me up every single time I read it. And if I ever feel frustrated or can’t remember why I’m doing what I’m doing, I go back and read this email because I was still, it’s still done something meaningful. Um, recipes do matter. So it matters. Leigh Olson: I so agree with you. We need t-shirts that say recipes matter. So if you had one piece of sagely advice about the bubula what would that be? Beth Lee: Don’t skip the cinnamon sugar at the end or try a different topping. Try syrup. Because one thing we really believe in this house is it’s nice to know what the tradition is, but then let it evolve, you know, we all have different backgrounds and in our family we have different religions, different ethnicities and cultural backgrounds. So let it evolve. If something you know from another tradition makes sense with the bubula, you want to try a different topping. Do it, make it your own. Leigh Olson: If you enjoyed hearing Beth’s memories about matzo meal pancakes and soy sauce eggs, and want to hear more stories like this, please subscribe wherever you get your podcasts. And if you could take five minutes away from the skillet and leave a rating and review, it’ll help me reach more people like you who loves stories about food. 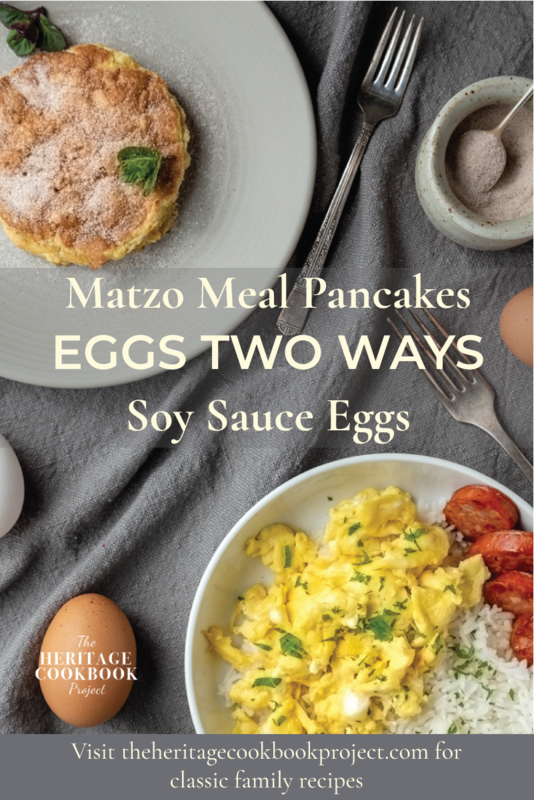 The full recipe for matzo, meal pancakes and soy sauce eggs can be found at theheritagecookbookproject.com. And don’t forget to register for access to the printable cookbook pages. Oh, and the lighting of the two candles at Shabbat signifies the observance of two mitzvahs or commandments. The first, remember the day of Shabbat and make it holy and the second, keep the day of Shabbat and make it holy. 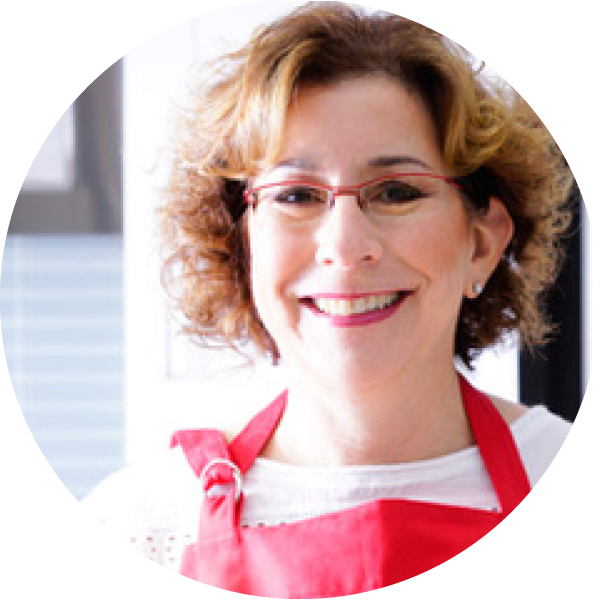 I connect with Beth Lee, of OMG Yummy, who shares her childhood memories of challah and matzo meal pancakes, and talks about how one ingredient can represent the blending of two very different cultures. 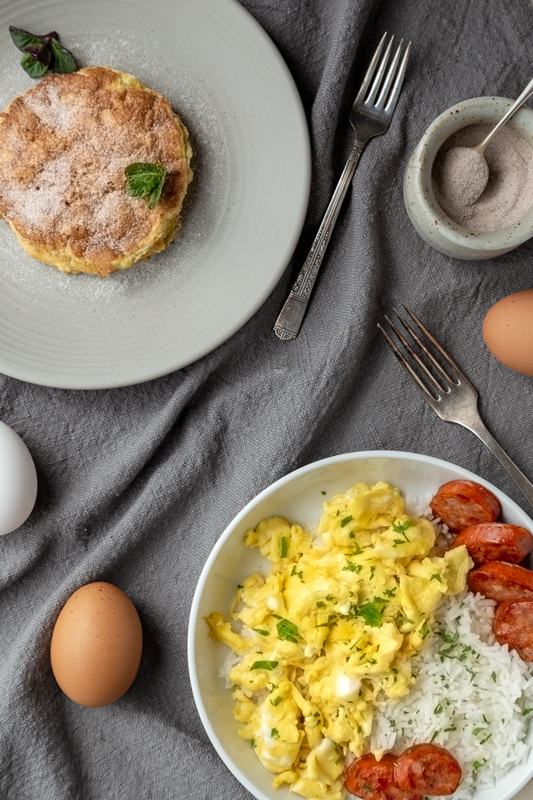 Even if you don’t celebrate Passover or have ties to Hawaii, you can enjoy fluffy Matzo Meal Pancakes or Soy Sauce Eggs for breakfast this weekend. Thank you to our Sponsor Bob’s Red Mill for keeping my pantry full of fabulous flours and baking products! Beth’s Grandma Annie at a family circle and Beth’s family around the table in her Aunt’s Brooklyn apartment. Beth’s family around the table in her Aunt’s Brooklyn apartment and Beth’s Grandma Annie at a family circle. These two recipes epitomize the blended cultures of Beth and Doug Lee. One is a matzo meal pancake Beth remembers her Jewish grandma making and the other a breakfast that honors Doug's Korean-Hawaiian background. Separate 2 eggs. Put the whites in a medium bowl, big enough for whipping them. Place the yellows in a similar size bowl. To the yolks, add 2 tablespoons of matzo meal, one tablespoon of sparkling water (seltzer), and a pinch of salt. Combine, using a small whisk or fork. Whip the egg whites to stiff peaks and then fold the egg whites into the yellow mixture. Heat a small skillet on medium to medium-high. Once heated, add one tablespoon of oil, then add the matzo meal mixture. Cook until you see it sizzle around the edges and firm up. Then, depending on your skill in the kitchen, you can either flip the pancake like a pro or grab a spatula to turn it over. (Dormant chef flipped, I used a spatula) It should be nicely browned. It only needs to cook briefly on the flip side to brown and finish firming up the interior. Flip the bubula onto a plate, sprinkle with granulated sugar. A little cinnamon is nice too. Powdered sugar would be attractive but I have always loved the texture of the granulated sugar with the matzo meal pancake. In a skillet over medium-high heat, cook the Portuguese sausage slices until nicely browned on both sides, about 2 minutes per side. Whisk together the eggs, and soy sauce. Heat another pan over medium-low heat, add the oil, and then the egg mixture. Stir occasionally with a rubber spatula, cooking slowly and evenly, about 2 - 3 minutes depending upon your stove. Serve the eggs and sausage slices over warm rice. As a blogger, I saw how you can connect with not only people you don’t know around the world, but even your own family. 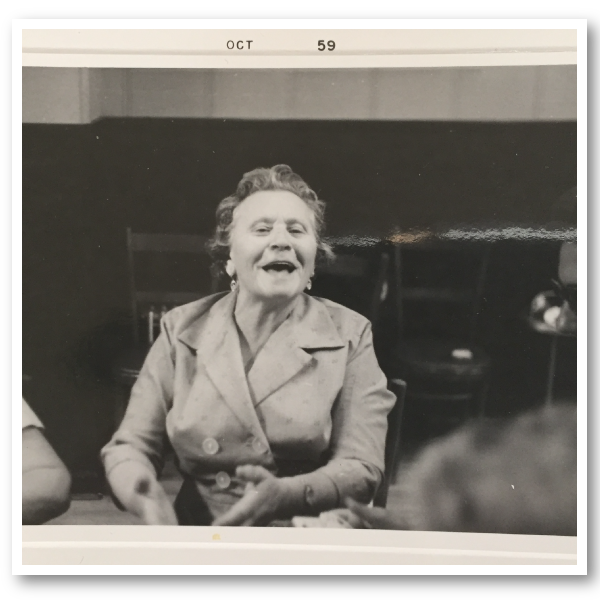 Such wonderful stories and food memories! Love this so much! I forgot about those awesome photos I sent you! What a great surprise when I scrolled through. This has been such an honor and a treat to do this episode with you. I hope you will consider repeaters on your show because I am getting excited to share more! Even those images brought a tear to my eye!! Thank you so much for sharing your story!! And yes, always room for repeaters. We all so many wonderful stories to tell. Can’t wait to hear your next one 😉 Hugs! I am so excited to try this now that I have found gluten free matzo meal!! Yay, gluten free matzo meal! Let me know if you try it with the manischewitz wine like Beth’s cousin. Cheers!